Charitable gift annuities are among the most common and popular of the planned gifts that produce a life income. Charitable gift annuities are among the most common and popular of the planned gifts that produce a life income. Through a charitable gift annuity you make a gift to a charity and receive an income for life and, if you desire, an income for a second beneficiary. Spouses can make a joint gift providing income streams for their joint lifetimes. Unmarried individuals also may make gifts that provide income to annuitants. 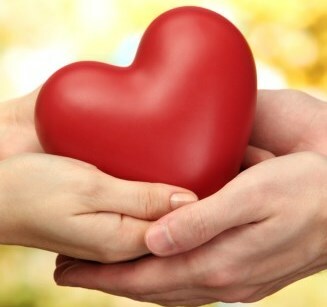 Upon the death of the survivor beneficiary, the charity receives the remainder of the gift. A portion of the income is tax free, and you claim a charitable income tax deduction that is based on the beneficiary’s age(s), discount rate, and frequency of payment. Charitable gift annuities are age sensitive—higher rates are paid to older donors. They provide the greatest financial benefit to donors over age 70, who receive the highest income rates. The charitable gift annuity is a contract between you and the charity. The charity is legally obligated to pay a fixed rate of income for your lifetime that is locked in at the time the gift is made. However, if you make a new gift a year or two later, the rate will likely be a little higher for that gift annuity since you are a little older. A charitable gift annuity is in reality a bargain sale—part sale and part gift, because you are giving an amount to the charity that exceeds the annuity it promises you. The annuity is backed by the general assets of the charity but is an unsecured obligation. Very few charities have ever defaulted on payments of gift annuities. Speak to the charity’s treasurer or business officer to determine the charity’s insurance coverage. Some states require a charity to register with the state if they offer charitable gift annuities. If you are unsure about the financial stability of the charity, check with the state’s insurance commission, secretary of state, or other offices depending on the state. If you require that the charity purchase a commercial annuity contract to insure that payments will be made, your charitable income tax deduction may be affected by the premium paid to the commercial carrier. If you are married, ask the charity to use its planned giving software to calculate if you made the gift both individually and jointly. Compare the benefits of the calculations to select the best option. Most charities use planned giving software to calculate your charitable income tax deduction and other financial consequences of the gift. The exact value of the deduction is determined by subtracting the present value of the annuity (life income interest) from the present value of the gift to determine the remainder interest to the charity, which is equal to the donor’s charitable income tax deduction. The value of the annuity is determined by applying the Internal Revenue Service (IRS) discount rate to the stream of payments over your life expectancy and that of any other beneficiary. (The IRS discount rate is 120 percent of the federal midterm rate, which changes monthly.) The charity, when calculating your charitable income tax deduction, can use the rate for the month in which the gift is made or use the rate from either of the two preceding months. Income for life paid annually, semiannually, quarterly, or monthly. Fixed rate often greater than money market rates. Immediate charitable income tax deduction for 35 to 50 percent of the gift amount. Opportunity to support a charity. Produce a life income where you receive an income for life. Your second beneficiary and Spouse can also benefit. Greatest financial benefit to donors over age 70. Based on the discount rate, and frequency of payment which is not always favourable to the annuitants. Charitable gift annuities are age sensitive—higher rates are paid to older donors. Your charity might ceases to exist, suffers financial setbacks, or goes bankrupt. Some charities may not have enough insurance coverage or reinsurance to protect their charitable gift annuities. Some may also defaulted on payments. In case of contract purchase, your charitable income tax deduction may be affected by the premium paid to the commercial carrier. The number and age of the beneficiaries affect your annuity rate. Most charities follow the recommendations of the American Council on Gift Annuities, an organization that recommends rates that charities pay to annuitants. The rates are the same for both sexes at the same ages, encouraging donors to make gifts to the charity they truly wish to support rather than selecting one because it offers a higher rate. Occasionally charities deviate from the suggested rates. It is important to remember that asking for a rate that is greater than the recommended rate increases the risk that the charity’s remainder will be diminished or depleted. A charitable gift annuity is just that: a charitable gift that provides resources to charities. These options are not designed to compete with commercial annuities or other forms of financial investments. 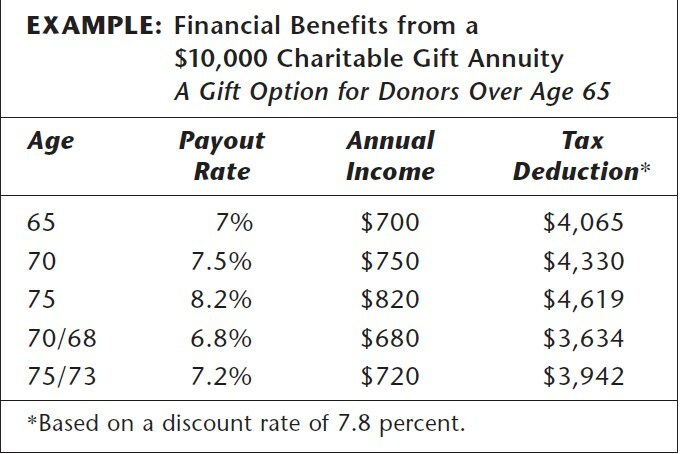 The American Council on Gift Annuities, an organization that recommends rates that charities may follow, revises the gift annuity rates periodically. The example below shows the financial benefits from a $10,000 charitable gift annuity. Various tax consequences occur for charitable gift annuities. In the following subsections, we examine the donor’s charitable income tax deduction and gift, capital gains, and estate tax consequences. Depending on your age, the discount rate, and the rates suggested by the American Council on Gift Annuities, you will likely receive a charitable income tax deduction of approximately 35 to 50 percent of the gift. The highest discount rate is usually selected to ensure the highest charitable income tax deduction. You obtain a charitable income tax deduction in the year the gift is made. If you cannot use the deduction completely in the first year, it is carried forward for up to five additional years. For gifts of cash, the charitable income tax deduction may be used to offset up to 50 percent of the donor’s adjusted gross income. If the gift is funded with appreciated property (that would produce long-term capital gain on sale), the charitable income tax deduction may be used to offset up to 30 percent of the donor’s adjusted gross income. charitable gift annuity. If you are the first annuitant and reserve the right to revoke the interest of the second beneficiary, no gift is made until your death. Your estate will pay tax on the value of the second beneficiary’s annuity at that time. Use your annual exclusion to reduce the size of your estate. You can make tax-free gifts of up to $10,000 per year to any number of beneficiaries. Married couples may combine their annual exclusions to make tax-free gifts of $20,000 per year. the first beneficiary, the gain can be spread out by reporting it over your life expectancy. If your spouse is younger, you may prefer to report the gain over your spouse’s lifetime. If so, make an outright gift to your spouse of the appreciated property, which can be accomplished without tax consequences by using the unlimited marital deduction. The unlimited marital deduction allows spouses to freely transfer unlimited amounts of property, cash, or other assets to each other without paying gift or estate taxes on the transfer. Your spouse then can make the gift to fund the charitable gift annuity. A portion of the stream of income received by the beneficiary will be excluded from gross income because it is considered a tax-free return of capital. The rest is taxed as ordinary income and as capital gain income, if appreciated property is used to fund the gift. Once you reach your life expectancy (calculated at the date of the gift), the entire amount of the annuity is taxable. Spouses who are U.S. citizens can transfer any amount of property to each other tax free using the unlimited marital deduction. If you are the only annuitant, the income stream ceases on your death and the value of the annuity is excluded from your estate. If your spouse is the sole remaining annuitant, your spouse’s interest may qualify for the estate tax marital deduction. If a third person is the sole remaining annuitant and you have retained, but not exercised, the right to revoke that person’s annuity, the value of the third party’s annuity will be taxed in your estate. The most common and easiest way to fund a charitable gift annuity is to use cash. You also can fund charitable gift annuities with securities, but if the securities have appreciated, you still will have to pay capital gains taxes on the gain in the “sale” part of the transaction. For many donors, the capital gains tax rate (20 percent for most investment assets such as stock) is less than their marginal income tax rate. Tax-free securities are also acceptable to fund a charitable gift annuity, but the annuity will be taxed as if the assets transferred were not tax exempt. Occasionally real estate can be used to fund a charitable gift annuity, if the real estate can be sold and converted to cash quickly. Because the charitable gift annuity payment is an immediate obligation of the charity, non-income-producing assets, such as real estate, need to be sold and converted to income-producing assets so that the payment can be made. You and the charity need to be realistic about the likelihood of resale in case the real estate sale is delayed or the property sells for less than anticipated. Keep in mind that other costs associated with real estate, such as broker’s commissions and attorney’s fees, will reduce the amount of sale proceeds below the appraised fair market value of the contributed real estate. The charity and the donor should share the responsibility for these costs, or they should be negotiated. Because charitable gift annuities are contractual agreements, the only document needed is a one-page gift annuity contract, prepared by the charity, which includes the annuity rate, amount of payment, and the payment schedule, which is most often monthly but may be quarterly or annually. Many charitable gift annuities are managed in-house by the charity, although they can be administered outside of the charity, usually by a bank, trust company, or investment firm. Ask the charity how its program is managed and be sure you know whom to call in case of questions and/or late or missing payments.